A classic Southern pound cake recipe that's moist and delicious with hints of vanilla and lemon. Down South, or at least in my circle of friends and family, pound cakes are identified by whose recipe was used. You don’t have vanilla pound cake or lemon pound cake or buttermilk pound cake, you have Aunt Virginia’s Pound Cake or Ms. Shirley’s Pound Cake or MayBelle Prichard’s Pound Cake. And you have all of their recipes because they’re all different. Aunt Virginia’s pound cake was the one most sought after in my family. But, God rest her sweet soul, I always found it to be a little too eggy and dense. So every time I’d make a pound cake, I’d start with Aunt Virginia’s recipe and alter it a bit. After several years and a lot of research, I finally nailed down what I think is the best pound cake recipe ever. The first time I ever saw a certain renowned hotel's famous pound cake recipe I was both mortified and elated. It’s almost exactly like mine. I was mortified because it took me years to perfect my recipe and, if you hadn't been on my pound cake journey with me over the years, you might think I’d just used theirs. I didn't, by the way. You can ask my mama. But I was elated too because that must mean my recipe is good enough to be famous! You can change up the extracts to suit your fancy. Sometimes I use all vanilla. Sometimes I use vanilla and almond. Sometimes I use butternut and sometimes I use all lemon (just always use 3 teaspoons total). But my favorite combo is vanilla and lemon. The lemon is still subtle enough that the cake doesn't scream, “Pucker up, heifers! I’m lemon!” but it’s just the right amount of brightness to compliment all the warm notes of a traditional pound cake. 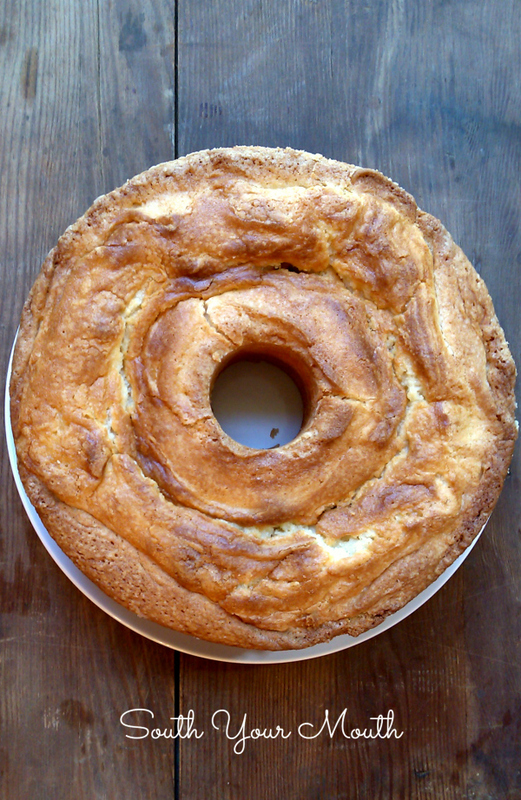 And, in keeping with the Southern tradition, I’m going to call this Mandy’s Pound Cake. It feels a little weird to name a recipe after myself but I've heard Mama call it that enough times that it sounds natural now. Where they live, it's what I call a bundt pan. You can make this in both but if you use a bundt pan, make sure it’s 12-cup or larger (or only fill 2/3 full) as the recipe makes a lot of batter. I do not recommend making this in a pan that doesn't have an open center as you will most certainly have to over-bake the cake to get it cooked through in the middle. Bring all ingredients to room temperature. Grease (with shortening) and flour a 10-inch tube pan; set aside. "Creaming" is a very important step in most cakes, especially pound cakes, so take care to follow the instructions carefully. In a large bowl or stand mixer beat butter and shortening at medium speed for 1 minute. Gradually add sugar, beating at medium speed, until light, fluffy and very pale yellow in color (5-7 minutes). When the mixture has almost doubled in size, everything's been properly creamed. Don't mix longer than this or the mixture will "break" and your cake won't rise correctly. Add extracts and eggs, one at a time, beating well after each. Sift together flour, baking powder and salt in a separate bowl. Gradually add flour mixture and buttermilk to creamed mixture, mixing at low speed until combined, beginning and ending with flour mixture. Pour batter into prepared pan and bake at 350 degrees for 1 hour and 15 minutes or until toothpick inserted in the center comes out clean. Cool in pan, then plate top-side up. Store at room temperature in an airtight container. You need both the butter and the shortening as the butter tastes rich and delicious but the shortening has a higher melting point and makes a more tender cake. This looks fabulous ! I have 2 questions - first, can I use two loaf pans successfully (we like the smaller size) , and then Second question, does it freeze well ? I can't say for sure about the loaf pans since I've never made them that way myself but I think if you're dividing the batter, it should be OK. This cake freezes beautifully! I think it would be great but I'd check it at an hour as it will likely cook faster.Thanksgiving sounds great! LOL! I would lower the temperature by 25* to 325* when baking in cast iron. This looks like a very good recipe. There are multiple ways to measure flour and they produce significant differences in amounts of flour, and then quite different results in the end product which causes mixed (and sometimes unpleasant) results. When you make this recipe, do you scoop the flour and level or do you fluff the flour and sprinkle it into the measuring cup? Or, do you have weight measurements? 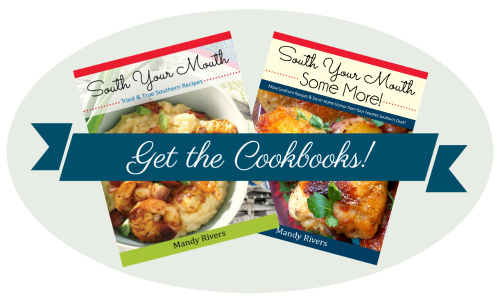 Thanks for your recipes from a GRITS (Girl Raised in The South). I fill a measuring cup with spoonfuls of flour then level it off. Well alright Mandy with your bad self! I'm going to take this one for a spin. I just made one with whipping cream and butter and 6 eggs--going to try yours when gone. What about the buttermilk--does it matter if non-fat? That's all I've been finding lately. I've made it both ways since it IS hard to find regular buttermilk these days and I can't really tell much of a difference. And what's up with that? If we're cooking something with buttermilk in it, I think it's safe to say it's not a low-fat recipe anyway, right? Gimme the good stuff! The weight of the batter holds it in place. Sometimes, a tiny bit will come out of the bottom of mine, but I just put it on a cookie sheet, and it's not a big deal to the overall performance of the cake. I place the bottom of the pan on wax paper or parchment paper and trace, then cut out. Place the circle in the bottom of pan and put the tube part back in and this prevents any spills. I have done this for years. After a lot of use some pans seem to warp. Hope this helps. 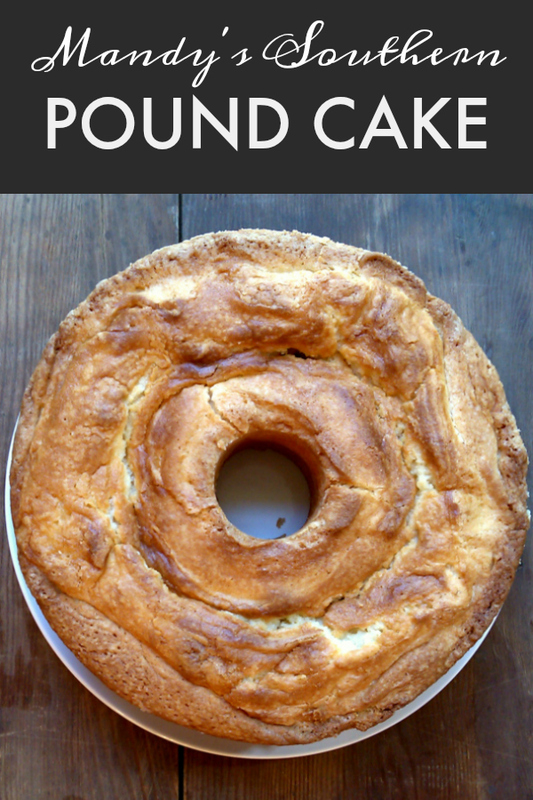 I'm stopping by from Weekend Potluck to say this pound cake looks delicious! I like your tip on using both butter and shortening. Oh, Adrian! Oh! You have just MADE my whole day. Maybe my whole month! Thank you so much for sharing this with me. Thank you! Thank you! Thank you! Mandy, I also made your cake this past week and it was delicious and very moist! I substituted 1 tsp of fresh lemon juice for one of the tsp of lemon extract. Thanks for a great recipe! I'm not sure. I mean, you can but I don't know what to adjust to account for the cornstarch that's in cake flour. Maybe nothing. I haven't made it with cake flour so I really can't say. Hello Miss Mandy! I am about to make your pound cake as a tester(I always follow a recipe, then make a second one with my own touch). Have you ever put fruit such as blueberries or raspberries in your PC? Just askin. Thank you in advance for replying. No, I can't say that I have. Pound cakes can be so finicky, I think I'd be scared to try! 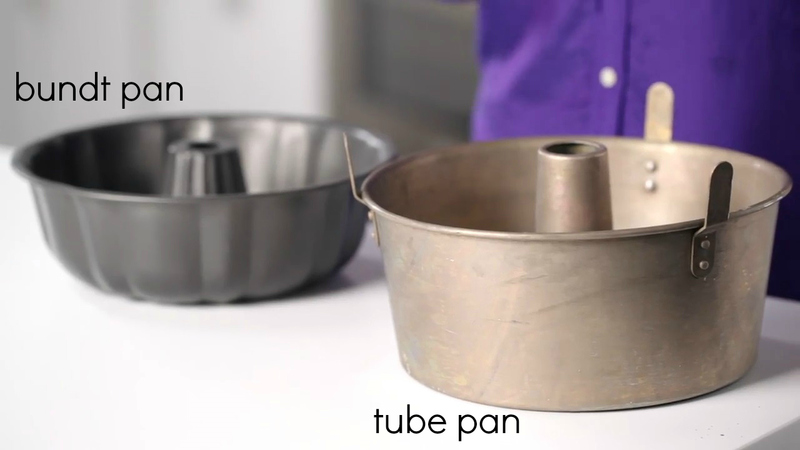 I was taught that the tube pans with removable bottoms were actually angel food cake pans. I'm happy to have my mom's tube cake pan with a permanent bottom. They are very hard to find now. I also have a smaller tube pan that belonged to my grandmother. She called it her half-pound cake pan. I've made MANY pound cakes through the years, but am anxious to try yours. I'm not eating sugar these days, but maybe there will be a potluck soon! I love pound cake....so does my husband and dad (because they don't care for frosting) they loved it....my dad so much, he called me this morning and asked me to make another one. So it is in the oven. Thanks for the yummy recipe. 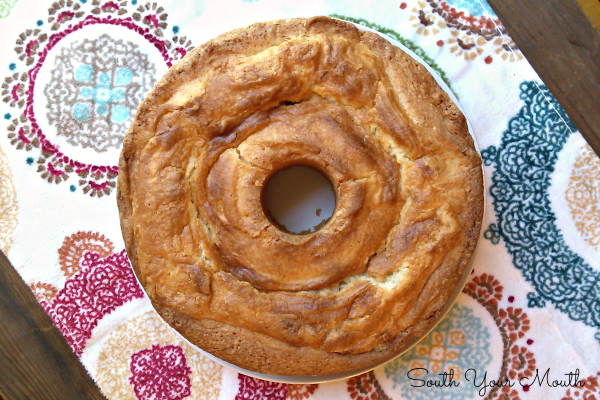 I LOVE pound cake and can't wait to try this one - it kind of reminds me of my Grandma's recipe. And ladies, you can get an old fashioned tube pan from Amazon!! when I don't have buttermilk on hand, I use a combination of sour cream and milk which works much better than the vinegar method. my family can always taste the vinegar. I love this recipe. I have made this cake 2-times. Only change I made was I used 2-Cups of flour with 1-cup of Cake flour. Great Texture! I would like to know how you can make this gluten free? ***** 5 stars from me! I made this recipe the other day with my little girls and we all loved it! My FIL asked if I could make it chocolate. Can I just add cocoa powder to this recipe? Yes, you could add about 4 tablespoons of cocoa (or more if you want more chocolate flavor). You could also add a little espresso powder to bring out the chocolate flavor. I think I would omit the lemon extract, and just use more vanilla. Does this go into a preheated oven or cold oven? I am going to guess preheated with the length of time it takes to cook. Hopefully Mandy will let us know for sure. when I make a substitute for buttermilk, I mix milk with sour cream, I can always taste the vinegar in the other method. the last pound cake I made was an Amaretto Pound Cake. Have made this twice now and it is Wonderful!! I omit the lemon extract and just use vanilla so we can make strawberry shortcake. Perfect summer dessert!! Measure first, then sift. I fill a measuring cup with spoonfuls of flour then level it off to measure. I don't care for lemon flavoring in cakes. So if I omitted that would you suggest I add more vanilla, or just skip it and keep the vanilla the same? Use 3 teaspoons vanilla. I do that sometimes! Best pound cake. I think the shortening made the difference. Missing a egg (found behind the bowl!) It's cooling now. It looks fine any comments on the taste?